Poke holes all over the pork belly skin with a carving fork (making sure every hole you poke reaches the the fatty layer of the pork). Mix 1 1/2 tbsp salt, 1 1/2 Chinese Five Spice Powder, all the sugar and garlic together in a bowl. Marinate pork by rubbing spice mixture all over throughly. 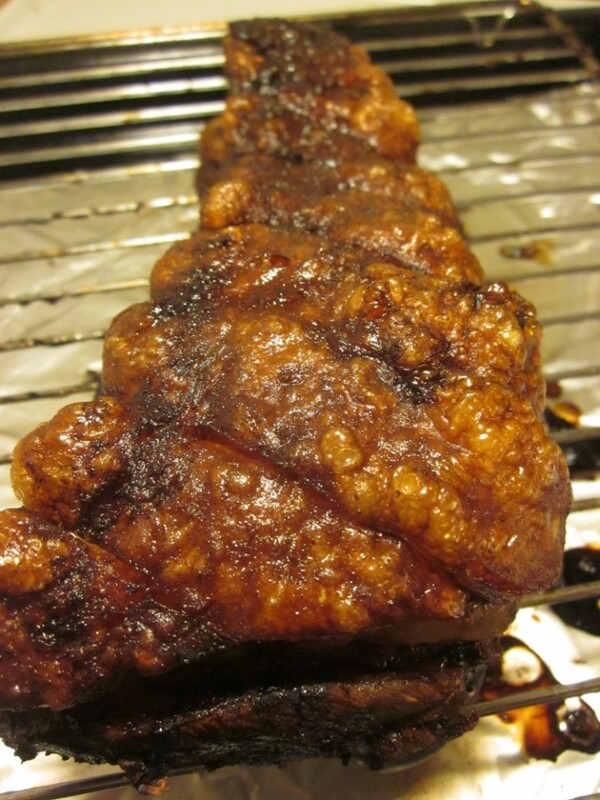 Place pork in a plactic bag to marinate in the fridge overnight. Leave Pork out in room temperature. Place pork in a pot with the skin facing down. Add water just enough to cover the skin then 1 tbsp of salt to the water (remember water must not be too much). Bring to boil and then lower the heat to simmer with a cover for 20 minutes. After boiling, take pork out and pat dry with a towel. Preheat oven to 170 Celcius to roast, at the meantime you can poke more holes or cut some lines on the skin. Rub 1 tbsp of Five Spice Powder all over the pork, place pork with skin facing up in the lower rack of the oven. Roast for about 1 hour 15 minutes. Then set your oven to 200 celcius (upper grill mark setting). Transfer the pork to the middle rack in the over, grill skin until it crispy. Be very watchful this final stage, once the skin started to blister, it will burn very fast.